For one night only we’re transforming Locust Projects into a documentary production studio to capture the most important and immediate aspect of the coming season: you. Come and play your part, on-camera and off-camera, and enjoy the heat of the moment. Saturday, July 11, 155 NE 38 St, from 7-10pm. 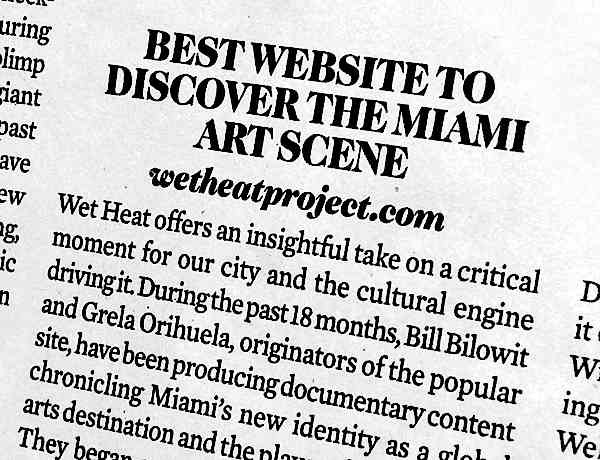 The 2009 New Times “Best Of” issue hit the stands this week, with Wet Heat Project declared among Miami’s Best. We’re most proud of the active word in the headline: DISCOVER. Click here to read the listing online at New Times. Click here to visit our Wet Heat Project site for an overview and links to all our productions. Click here to do some discovering on our wetheat.tv channels, with (as of today) more than 20 mini-documentaries capturing Miami artists at work, installation / performances, and a special 2-part microcosm of the ’08 fair week from the aisles of PULSE. Or just click one of the images on the sidebar at right to go directly to a series. 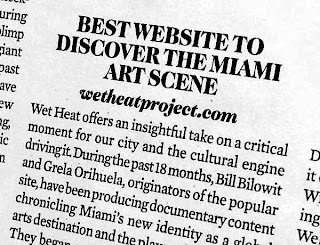 Thanks very much to New Times for the recognition, and to the thousands of visitors that put Wet Heat in their radar. Have you seen Guerra de la Paz, Provisero, Woodgate on wetheat.tv? In their Little Haiti studio, Guerra de la Paz packs and crates a show for a New York opening (at Daneyal Mahmood Gallery on June 18). In his South Miami studio / lab, Ralph Provisero fabricates, prepares and conceives in all manner of medium. At Spinello Gallery, Agustina Woodgate performs a transcendental fairy tale.